How does the Kasina work? How will I feel when I use a Kasina? Is the Kasina safe to use? How quickly will I feel the benefits of using a Kasina? When should I use a Kasina? What sounds will I hear through the headphones? How does the Kasina compare to programs like Holosync? Is the Kasina difficult to use? Can a Kasina help with sleep problems? Can I use a Kasina with Personal Development tapes and CDs? Why should I buy a Kasina from Kasina-UK? 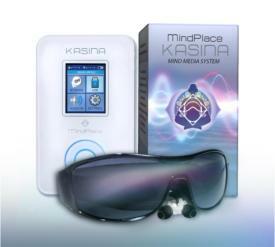 Kasina uses a sophisticated form of audio and visual technology that uses light and sound to guide you gently and automatically into a deep state of mind and body. A Kasina consists of a small control unit (about the size of a smart phone), a set of headphones and special glasses that contain small LED lights. Through the headphones you'll hear special tones and pulses (known as binaural and isochronic beats) that have been shown to be very helpful for leading the brain into more relaxed states. At the same time, the lights in the glasses start to flash at the same frequency as the audio tones. (You would normally have your eyes closed, but you can see the lights gently flickering behind your closed eyelids.). The pulses of light and sound start off quite fast as they need to engage your brain which ticks over quickly at the normal level of consciousness. Gradually, the pulses slow down and your brain will automatically follow suit and slow down in unison. The imagery created by the light and sound provides a focus for your mind and quietens internal dialogue or chatter. The various areas of your brain begin to integrate into one whole, harmonious unit as experienced by masters of meditation. The tone, frequency and other parameters of the light and sound vary the effect. The Kasina has many different sessions built into it for meditation, relaxation, stimulation, creative visualization and so on. After your session, you may have feelings of peace, tranquility and calm. Remember the great thing about using a Kasina is that your mind will automatically slow down and relax. You will be getting tremendous benefits even if you are not aware of anything happening. As with any device that generates flickering lights (such as television and video games consoles) the use of a Kasina is safe for most people and no side-effects are known. However, there are a few specific cases where a Kasina should only be used with the approval and monitoring of a medical professional. This includes people suffering from any sort of serious medical condition such as epilepsy, brain damage, mental impairments, visual photosensitivity and any form of macular degeneration. This also includes people using a pacemaker or suffering cardiac arrhythmia or other heart disorders. The benefits derived from using a Kasina increase over time. Some people experience benefits the first time they try one, with immediate feelings of calmness and restfulness. Others start to see significant improvements after several weeks - with continuing progress. Be patient if you feel that you are not making progress as quickly as you would like. Even if you are not aware of it at the beginning, you will be getting important physical and psychological benefits every time you use a Kasina. The changes can be subtle at first. You may start to find that you have more energy and that your sleep patterns have improved. You may find yourself becoming less angry and reacting to stressful situations in a more controlled manner. You may find that your attitude to life changes and that you have a greater sense of balance. These changes are often gradual and you notice them after using your Kasina for some time. Using a Kasina is beneficial at any time. Some people like to use it early in the morning as this provides a great start to the day. Equally, some people like to use it in the evening to help relax and refresh them after work. If you have the time, of course, you can use your Kasina in both the morning and evening to increase the beneficial effects. Some people even fit in another session at midday as a way of energising themselves for the afternoon. Regular use of your Kasina will achieve the best results. Try to make it part of your routine. As a general guide, you should use it at least three times per week. The sounds produced by the Kasina consists of soothing pulses and tones that have been found to be very conducive to gently guiding the brain into deeper, relaxed states. We believe that the Kasina is much more effective than audio CDs like those from the Holosync Programme. The reason is that the Kasina uses light and sound to help guide you into relaxed, meditative states of mind, whereas the Holysync CDs are only using sound. For most of us, sight is our primary sense and so it is the light stimulus that will have the major effect. Of course, with a Kasina, light and sound are being used together in a synchronized fashion and so the effect is even greater. It's worth pointing out that the tones and pulses produced by the Kasina are very similar to the sounds of the Holysync CDs. The Kasina has been designed to be very simple to operate. To start a session, you simply switch on the unit, select a session, put on the comfortable headphones and special glasses, and press the 'Play' button. The Kasina is very effective in helping with sleeping difficulties. Sleeping difficulties can be caused by many things. Using a Kasina helps to deal with one of the primary causes - mental stress. Stress can manifest itself at night as an overactive mind. The mental chatter we carry on inside our heads can overwhelm our ability to get a good night's rest. Using your Kasina immediately before you go to bed will help naturally to quieten your mind and relax your body. It will also help to produce the brain wave patterns that trigger sleep. In a more general way, using your Kasina over time will improve the way you handle stress and will condition your mind to be quieter and calmer. You will also notice improvements in physical and mental well-being and this will have a cumulative effect in improving your sleep patterns. A Kasina can greatly improve the effectiveness of various types of recorded materials such as personal-development and hypnosis programs. Your Kasina will move your mind into the optimal calm, relaxed state for the material to be most effective. Simply determine the length of the programme you intend to listen to, and then choose a relaxation session of approximately the same length. You can use the supplied 'patch' cable to mix the recorded material with the Kasina's built-in sounds. Alternatively, you can listen directly to the recorded material while running one of the relaxation sessions with just the special glasses on. We are the official UK distributors of the Kasina . Apart from the Kasina, we sell only a small range of complementary products. We support you in the use of your Kasina by keeping in touch with regular emails containing hints and tips for you to get the most from your Kasina sessions. We give away a powerful, 4 week 'Concentrate Your Mind' course worth £25 with every Kasina. The course will complement your Kasina, enabling you to get even more amazing results. Your Kasina will come with a 30 day satisfaction money-back guarantee. We will send out your Kasina by Royal Mail Special Delivery which guarantees that you will have it the next day if we receive your order before 3:00 pm. If you have any other questions, please contact us and we'll be happy to advise you without obligation.